Today, we had the opportunity to speak with Nancy Barbee, a District Governor for Rotary in North Carolina. Nancy has been instrumental in the End Polio Now campaign and bringing awareness to polio eradication in the US. Nancy’s involvement has given her a unique perspective on the impact of polio, as well as the means of educating communities on the importance of immunization. She strongly believes that although polio is currently directly impacting Pakistan, Afghanistan, and once again Nigeria, that it truly is a global problem. We had the privilege to learn more about Nancy’s perspective and experience and wanted to share it with you. Q: Thank you so much for speaking with us, Nancy. The work you’ve done on the polio front with Rotary has been amazing, but you weren’t always involved in health, correct? Can you tell us a bit about your background? N: Yes, that’s right. I’m actually an educator by trade. I have a masters in library science and spent 30+ years in elementary education. Literacy and storytelling is in my blood! I also love technology. When technology came to our media center, I took charge – making sure computers were in all the classrooms, that technology was integrated into the curriculum. I love learning about new gadgets, tech, innovation. Q: Can you tell us how you got involved with Rotary? N: I joined a local chapter in North Carolina in 2000. It was an amazing experience. I met so many wonderful people that were passionate about solving major problems. I got involved in various focus areas such as polio, literacy, peace, and in 2009 I became a District Governor. With the help of some great mentors, I’ve been able to get involved in projects I’m very passionate about. Q: Speaking of Polio, how did you become involved in the eradication effort? N: I went to India on a personal mission and met people who had polio. It was such an eye opening experience for me to see the impact of this terrible disease – to be honest, at that point I really had no idea that polio still existed. 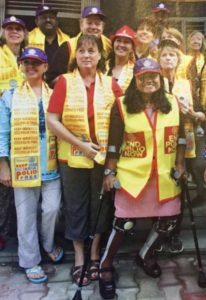 I witnessed polio corrective surgeries and soon after, I felt like polio began to tap me on the shoulder – “Are u going to do anything?” Coming back to the states, I realized that people here weren’t nearly as passionate about polio eradication as in India, and I really wanted to spread that passion here. I wanted others to see what I saw. Serendipitously, when I became governor in 2009, Bill Gates partnered with Rotary and pledged $365 million to polio eradication. That’s when “polio hit me in the face – are you going to do something?” That year, I organized a Rotary trip to take a group to India where we visited Delhi’s World Health Organization Office and St. Stephen’s Hospital where Dr. Matthew performed reconstructive surgeries on polio patients. It was an incredible experience that energized local clubs in the US. Q: Have you met anyone in particular along the way that has truly inspired you? N: Absolutely. I’ve met so many incredible people who have either been affected by polio or fighting to eradicate it. One person who stands out in particular is Minda Dentler (pictured above). Minda is originally from India, but when she contracted polio around the age of one, she was put up for adoption. Luckily, she was adopted by a wonderful family in Washington who encouraged her to do anything that she set her mind to. Although polio left her paralyzed, she learned to walk with crutches and became an avid hand cyclist. She now competes in triathlons and is a major proponent of global polio immunization. Her story is so inspiring, she’s a force to be reckoned with. Q: How did you get involved with Speaking Books? N: My mentor, Anne Matthews, actually introduced me to Brian Julius – a fellow Rotarian and founder of Speaking Books. As soon as I saw my first Speaking Book, I realized that a book that actually speaks to the user could have the endless possibilities to be involved in anything to do with Rotary. 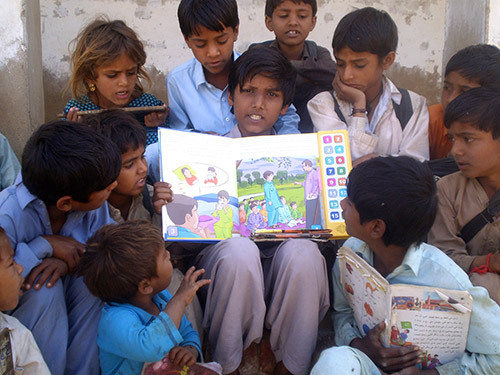 It’s sometimes so difficult to effectively communicate with developing communities, and Speaking Books is a great way to overcome the illiteracy hurdle. Q: You were instrumental in launching the Polio Speaking Book in Nigeria and Pakistan. Why did you believe this is worthwhile tool? N: One of the biggest challenges in immunizing children, is getting rid of the myth that vaccines harm children instead of helping them. That’s what the Speaking Book does. It allows us to tell a story that captures local culture and sentiments and bring forth characters that have influence (such as religious leaders), and with this story we’re able to further the understanding of the importance of immunization. It’s something people can relate to – it’s friendly, warm, and fuzzy. The results from the launch have been amazing – in Pakistan we’ve heard that health workers find the books very useful and use them when meeting with community members. Children show the book to each other and share it. The impact is huge – it’s really a part of a total package, but this is a tool that effectively reaches the children and children sometimes are the best way to reach parents. Q: Why has this effort been so important for you and what do you believe is the key to ending polio once and for all? N: It’s been so important because people have to remember that just because the countries affected by polio may seem far away, polio can come back at any time. Over 200 thousand people in the US are not vaccinated each year, it could spread so quickly. I believe the key is education – stories must be told – stories of why immunization is so important and what could happen if children are not given vaccines. It’s not just about educating people in the affected countries though, it’s about educating the world. We must work together to bring an end to this disease. Thank you Nancy. It’s been a pleasure speaking with you and we look forward to continuing our work together.